The finest example of Bronze Age acrobats is from the palace at Knossos on Crete. It was the center of the Minoan empire, which dominated trade as the single greatest maritime power the ancient world ever saw. 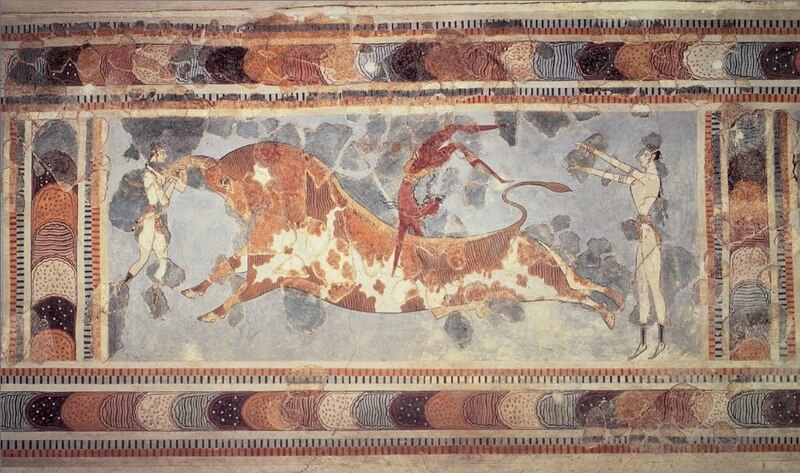 At the Knossos palace there are striking murals of lithe youths twirling and sailing through the horns of bulls. Acrobats would pass backwards through the horns of the bull. This bull leaping was often a part of celebratory festivals, and the athletes who performed these daring acts were seen as holy to the high king; passing through the space between the bulls’ horns was treated as an act of transformation and cleansing, a rite of passage, if you will. The bull leapers are often depicted as wearing very little clothing; having a nice chiton catch on a bull’s horn would be disastrous. 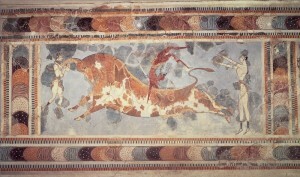 The leapers would approach the bull either from the back, standing on its haunches and launching themselves backwards toward the head, using the horns as handles, landing on the ground in front of the bull, or from head on, jumping through the horns and landing on the animal’s back and dismounting. They would use the bull’s strong tossing neck as leverage to perform difficult tricks. It must have been astounding to watch. Acrobat on a red-figure vase from the time of Alexander the Great. 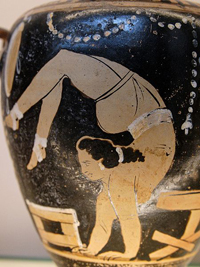 In high classical times, the city of Sparta, of which Menelaus and Helen are ancestors, trained its young women to be strong gymnasts and contortionists. The ancient Olympics did not include acrobatics in the competitive games, but its opening and closing ceremonies were centered around a large procession and sacrifice attended by acrobats. It seems like the acrobats, gymnasts, and contortionists were more closely associated with a physical expression the sacred than with athletic competition. Posted on March 29, 2011 by Mary	in Mary's Musings, Updates and tagged acrobatics. in fact many family friendly restaurants offer a party service so it is worth consulting with them. Tea lights are suitable and comfortable tunes really should be playing in the track record. Kids’ parties are a fabulous way for kids to have fun.